• Strength is best defined as the ability to do something. 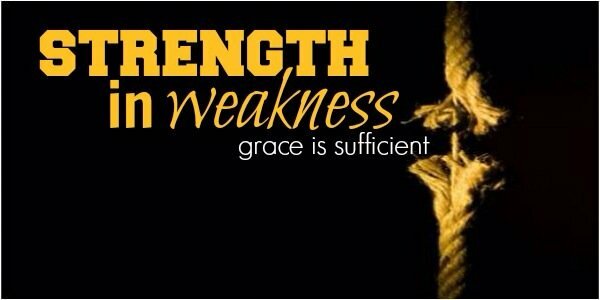 • Weakness means feeble, lacking in vigor; the root means to be strength- less. • Sin is the ultimate state of powerlessness and weakness. • Because we are weak, we lack the ability or the strength to do God’s will. • We need God’s strength in order to do His will. • His strength is made available to us by grace. Dr. Lewis Sperry Chafer, esteemed founder of the Dallas Theological Seminary, in his book “Grace: The Glorious Theme”, says that grace is” not withheld because of demerit”. In other words, whatever God is doing in the life of the believer it is not punishment even though it may feel that way. If anything it is designed to be corrective and even beyond that, transformative. The Holy Spirit is at work to change us and conform us into the image of Christ (Rom. 8:28-30). Yes, there are consequences for one’s actions (Psalm 38; Gal. 6:7-8). However, the notion that I wish to dispel is that our Heavenly Father “is out to get us.” As God’s child, He will never “send us to bed without supper” so to speak. When we have blown it is when we grace is most needed; It also when we see Grace most clearly. The beauty is that we do not need to work to get back into right relationship. We just need to repent. The nature of Grace precludes debt from being incurred. When God bestows His grace, we do not work to repay Him. As Schafer states, “no service is to be wrought, no offering is to be given…” with the notion of working down a debt to God. If we see God’s gift as something that we now need to repay, it ceases to be a gift. Furthermore, it obscures the motive behind the gift. The motive is God’s love. As a result we will fail to experience and walk in that love.1 John 4:19 states… because He first loved us”. Therefore our service to Him and to one another should be love for love and grace for grace. We love out of the grace given to us, we serve out of the grace we have received.